Raspberry Champagne Cocktail Last Year 2010 Farewell Drink! This Year is a milestone for my handsome dear husband, it's his 40th birthday on New Years Eve...It's so hard to plan a party. Dangerous to drive during the holiday, family all in NY. So, here's are agenda for the BIG 40!! Starting with breakfast. In a shaker, add ice cubes and above ingredients. Shake and strain. Pour into a sugar rimmed martini glass. Garnish with fruit kabob. Happy B'day to the hubster! Happy new year to both of you. Enjoy the celebration! Happy Birthday! And Happy New Year to you and your family! Rum runner in colour-sugared glass looks so great! Happy Happy Birthday to you Nemo! Happy birthday to your hubby! He certainly doesn't look 40! What a fun day! Beautiful cocktail, yummy food....how fun to know all your happenings today! Best wishes to both of you! Sounds like y'all are gonna have some fun. Happy b-day, and a wonderful New Year, my friend! Happy birthday and happy new year to you and your family! Beautiful end of the year posting! The rum runner certainly looks welcoming... Happy Birthday to your husband. The 40's are the best! And Happy 2011 to you, Claudia. May it bring you delicious days. Holy moly, that cocktail looks amazing! Happy birthday to your hubby! The day you've planned sounds like so much fun! I miss Seaworld :( And great job on making the homemade croissants to go with your awesome breakfast! I've only made croissants in culinary school, but haven't quite convinced myself to go to all that effort alone in my kitchen :) Happy New Year to your whole family, Claudia! Happy Birthday! Best wishes to you and your family in the new year! 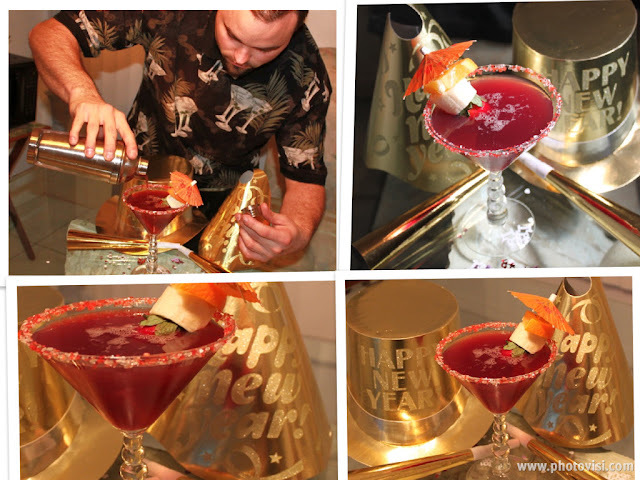 Fabulous New Year cocktail! I think that is a great way to toast in the new year! I am looking forward to enjoying your blog in 2011. As much as I'm rushing around today...I'm sooo glad not to have missed this very special post! Here's wishing you and your loved ones the very best the New Year has to offer. What a wonderful cocktail to ring in the New Year! Happy Birthday to Captain Nemo!! !You two are the cutest couple. And that's an awesome looking drink ... plus it's good for you. lol! Happy Birthday to your hubby, Claudia! You have a great day planned! Please drink an extra or 2 Rum Runners for me. They sound perfect. Here's wishing you and yours the best, Happy New Year! Sounds like a wonderful way to spend a birthday/NYE. Hope you both enjoyed it. The cocktail looks delicious! That cocktail looks delicious! Perfect treat to bring me back to summer days...Hope your night was great! Happy New Year! That drink looks spectacular! So beautiful!